Welcome to Topline Yacht Charters. Specialists in organising Caribbean yacht charters, the team at Topline Yacht Charters has a great deal of experience and understanding in organising sailing vacations, particularly crewed yacht charters in the British Virgin Islands. A crewed sailing vacation in the Caribbean is a unique vacation experience: the perfect blend of personally selected guests, gourmet cuisine and the luxurious accommodation of a boutique hotel. Add to this constantly changing scenery and a huge range of watersports. And all this from US$200 per person per night. Indulge yourself in the freedom of a Caribbean yacht charter – no sailing experience required, just relax, unwind and enjoy sharing this unique experience with your friends and family. The yachts are well equipped with powerful RIBs and offer a wide selection of water toys including snorkelling equipment. Most yachts also offer a range of watersports including wakeboarding, scuba diving, kayaking, windsurfing, waterskiing, tubing, knee-boarding and even kite-surfing. 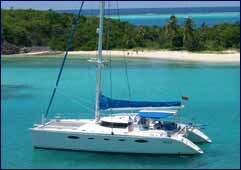 A Caribbean yacht charter is the perfect vacation solution. A vacation on a crewed charter yacht gives you all the luxury, service and fine-dining of a top hotel but the flexibility and freedom you can only get with your own personal yacht. Your professional and experienced crew will be gracious hosts, committed to making sure that you have a superb vacation…so that you have to go back again….and again. Enjoy a Caribbean sailing vacation at your pace and to your agenda. Simply tell us what you want from your Caribbean or BVI sailing vacation and we will recommend the most appropriate yachts and crews for you – whether it’s a sail boat, catamaran or luxury power boat.